The BBC's North America Editor, Justin Webb, addressed AmericaInTheWorld.com yesterday evening. We hope to publish the transcript of Justin's talk in due course. It was a great occasion attended by Labour and Conservative MPs and by Democrats and Republicans from the United States. 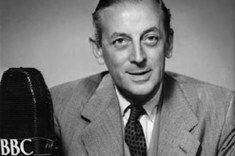 Many Britons - and many more across the world who listen to the BBC World Service - learnt about the USA through Alistair Cooke's Letter from America. The weekly 15 minute radio slot was the best known feature of an extraordinary 58 years of reporting US life. Memorable 'Letters' can be revisited here. On the occasion of what would have been Alistair's 100th birthday, BBC Radio has presented a 45 minute tribute to the great reporter and his relationship with America. You can listen to it here.